At the annual meeting of senior economic leaders from the 21 member economies of the Asia-Pacific Economic Cooperation forum held in Honolulu, Hawaii, this November, the United States reaffirmed its trade ties with the region and looked to pursue even more opportunities through the Trans-Pacific Partnership. John Ward is a writer in the International Trade Administration’s Office of Public Affairs. The Pacific Rim, which includes trading partners both large (China and Russia) and small (Brunei Darussalam), plays a vital part in the overall health of the U.S. economy and especially its export position. In 2010, the economies that make up the Asia-Pacific Economic Cooperation (APEC) forum, which includes 21 members from throughout the region, accounted for 61 percent of U.S. exports of goods ($775 billion) and more than 37 percent of U.S private services exports ($205 billion). About 5 million U.S. jobs are supported by these exports. In order to make concrete progress toward its goals, APEC holds working meetings and workshops throughout the year. These often include private-sector participants and on such topics as standards, environmental goods, and electronic commerce. In 2009, APEC launched its Ease of Doing Business Action Plan. It identified five priority areas for improving the business environment in APEC economies: (a) starting a business, (b) getting credit, (c) trading across borders, (d) enforcing contracts, and (e) dealing with permits. The action plan set an APEC-wide aspirational target to make it 25 percent cheaper, faster, and easier to do business within the APEC region by 2015, with an interim target of a 5 percent improvement by 2011. APEC’s efforts are already meeting with success: According to a recent study conducted by APEC’s independent research unit, between 2009 and 2010 improvement in the five key areas was 2.8 percent, exceeding the organization’s benchmark of 2.5 percent, and putting it well on the way to achieving its interim goal for 2011. 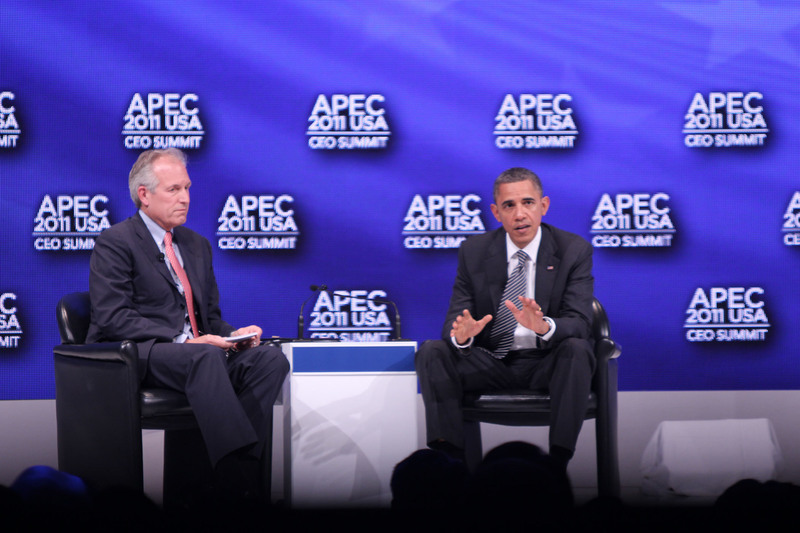 The annual APEC Economic Leaders’ Meeting was chaired this year by President Obama in Honolulu. It was the culminating event of a year-long series of meetings hosted by United States. At four main clusters of meetings during 2011, delegates from each of APEC’s 21 member economies participated in various committee meetings, workshops, and ministerial meetings, focusing on three main areas set forth by the United States in its role as the host economy: (a) strengthening regional economic integration and expanding trade, (b) expanding regulatory cooperation and advancing regulatory convergence, and (c) promoting green growth. The United States also led broad initiatives at APEC this year, including ones on women and the economy, food security, travel facilitation, cross-border privacy rules, and good governance and business ethics. The Department of Commerce played a key role in all of the initiatives that were led, or supported, by the U.S. government. One development with far-reaching potentials for trade in the region was the announcement by leaders of the nine Trans-Pacific Partnership (TPP) countries of the broad outlines of the TPP agreement. TPP is intended to be a regional trade agreement. Unlike the voluntary nature of agreements negotiated among APEC members, commitments in the TPP will be binding. TPP is currently being negotiated among the United States and eight other partners: Australia, Brunei Darussalam, Chile, Malaysia, New Zealand, Peru, Singapore, and Vietnam. The United States announced its intention to undertake TPP negotiations in November 2009, and since 2010, nine rounds of negotiations have been held. TPP addresses a range of issues not covered by past agreements in APEC. These include making regulatory systems of TPP countries more compatible and helping small and medium-sized enterprises (SMEs) to participate in the international marketplace. TPP countries are discussing elements for a labor chapter that will include commitments on labor rights protection and effective provisions on trade-related issues that would help to reinforce environmental protection. Lynn Costa, Anita Ramasastry, and Kelsey Scheich of the ITA’s Market Access and Compliance unit assisted with this report.